Got leftover rice? 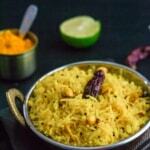 Turn it into Lemon rice – a popular and flavorful South Indian dish that you can make in less than 15 minutes. It also makes for an easy lunch box option that you can either put together the night before or in the morning without any fuss. Let’s admit – packing lunches can be daunting for a parent. Especially if your kid is like mine and prefers her lunch warm and heating up food in school is not an option. That’s why I am always looking for recipes like Lemon rice that taste great at room temperature. Leftover rice, lemon, and a few spices are all you need to get this one pot meal ready in no time. I love how versatile Lemon rice is – you can serve it by itself or pair it with a bowl of yogurt and lemon pickle on the side. Lemon rice also goes really well as a side dish with grilled fish or chicken (though it is not typically served that way in India). New to Indian cooking? Read this. 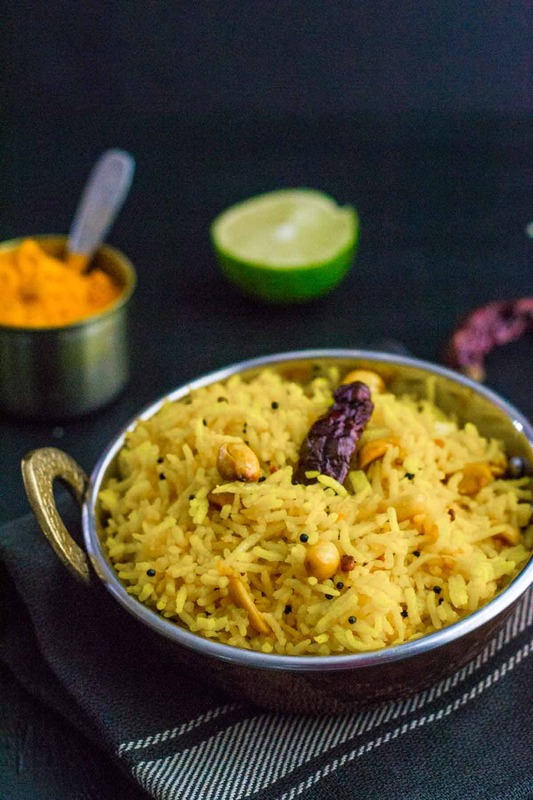 For those who are just starting to cook Indian food, this citrus flavored rice dish is a great recipe to start with. This Lemon rice recipe is very easy to follow and the only thing I would caution you about is the amount of lemon juice. Not all lemons are created equal and depending on the sourness of the lemon, adjust the amount of lemon juice. Is Lemon Rice made from Limes or Lemons? Limes are green and are tarter than the lemons, which are yellow in color and tend to be sweeter. In India, limes and lemons are used interchangeably. You will find limes on every street corner but lemons (especially the large ones that we find in the US) are hard to find. That’s why in India, limes are typically used for Lemon Rice. When choosing a lime, make sure to pick the one with the thinnest skin. Those ones yield the most juice. Also, rolling the lime on a flat surface before cutting it makes it easier to juice. Note – If you are looking for a recipe to make Basmati rice with each grain distinct and perfectly cooked, click on this link to learn how to make a perfect pot of rice. Heat coconut oil in a kadhai or wok over medium heat. Add mustard seeds and when they begin to pop, add urad dal, roasted peanuts, curry leaves, and asafoetida. Fry them for a few seconds and then add rice, lemon juice, salt, turmeric powder, and chili powder. Gently mix them together until all the ingredients are well combined. Take it off heat. Serve them with a side of pickle, if desired. Glad it helped you, Priya.